Last year, we were given two restaurant tips in Cambria: Indigo Moon Cafe and Robin’s Restaurant. (Stay tuned for the Indigo Moon Cafe review!) We didn’t try either of them. So this year, we vowed to visit them both if it killed us! And it didn’t! From the vegan’s perspective, both were winners. 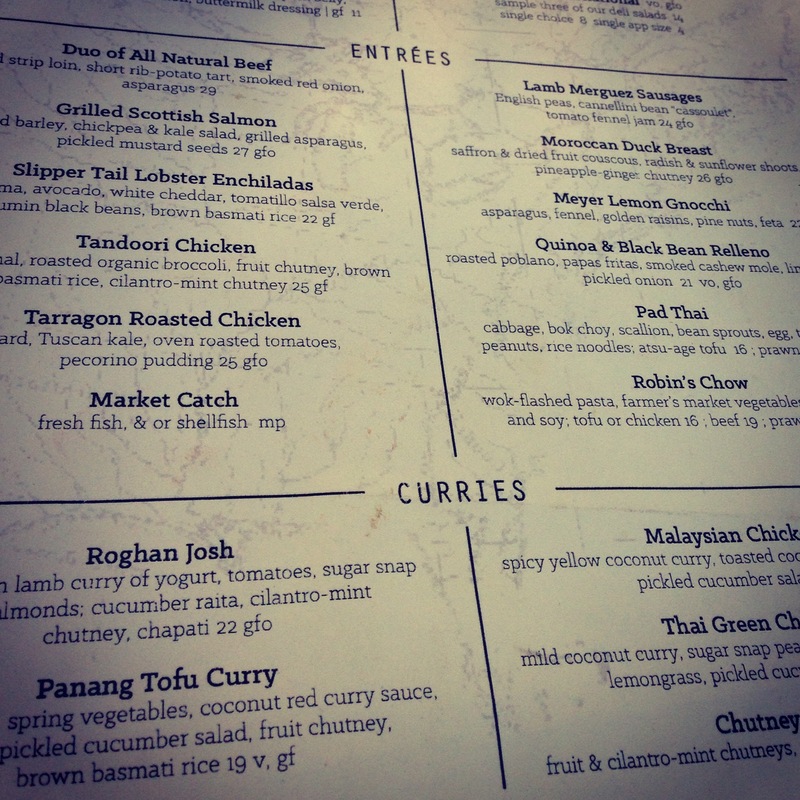 We started with Robin’s Restaurant on the first night because we were in the mood for their more Asian/Middle Eastern inspired fare. 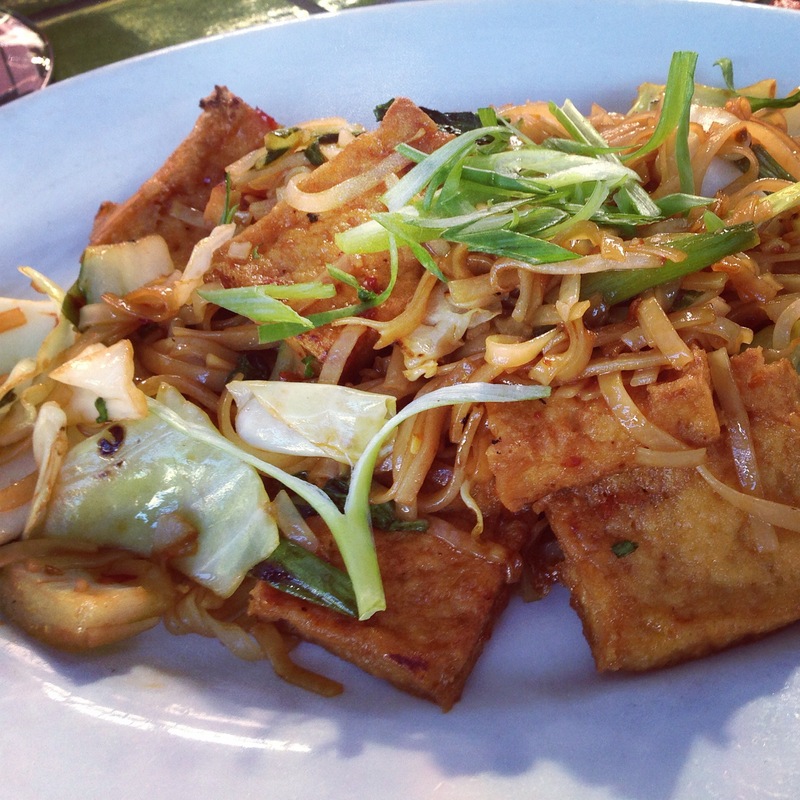 What jumped out from the online menu immediately was the Pad Thai, thus sealing the dining choice for the evening. Robin’s is a quaint little place, with a nice outdoor eating area. With the exception of the very loud guy next to us, it was a very pleasant place to be sitting. I’m unsure if this outdoor area is available year round, but be sure to sit out there weather permitting! The website boasts “the largest selection of unique vegetarian dishes on the coast.” And it’s true! With the exception of most of the entrees on the dinner menu, there are plenty of vegetarian and vegan options. When I told the server that I was vegan, he did tell me that some things were easier than others to turn vegan. I was still stuck on my choice of Pad Thai, so he jotted down a note to remove the egg, and we were all set! Seriously? 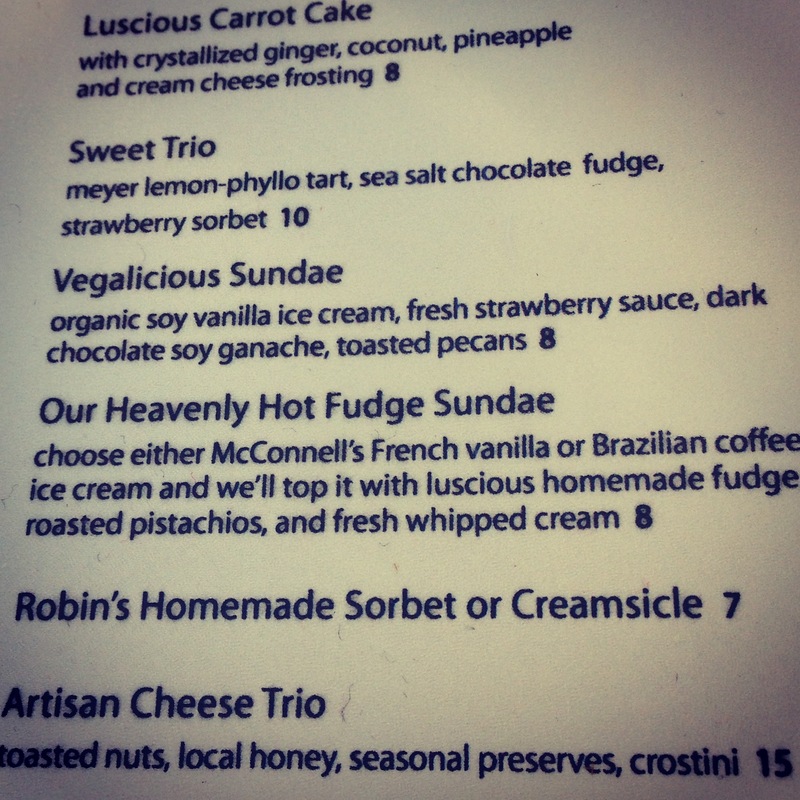 A vegan sundae right on the menu? And not the last thing listed, either, like some sad little unwanted throwaway for the token weirdo in the restaurant. Nope! Right there, 3rd from the top, ABOVE the Hot Fudge Sundae. Robin’s Restaurant for the win! I didn’t care if my stomach exploded from the effort, I was going to finish this thing. Look at that little beauty… I’m getting hungry all over again… The only thing that might have made it better would have been whipped coconut cream on top, maybe little chocolate nibs floating around near the bottom, and about 5 extra scoops. 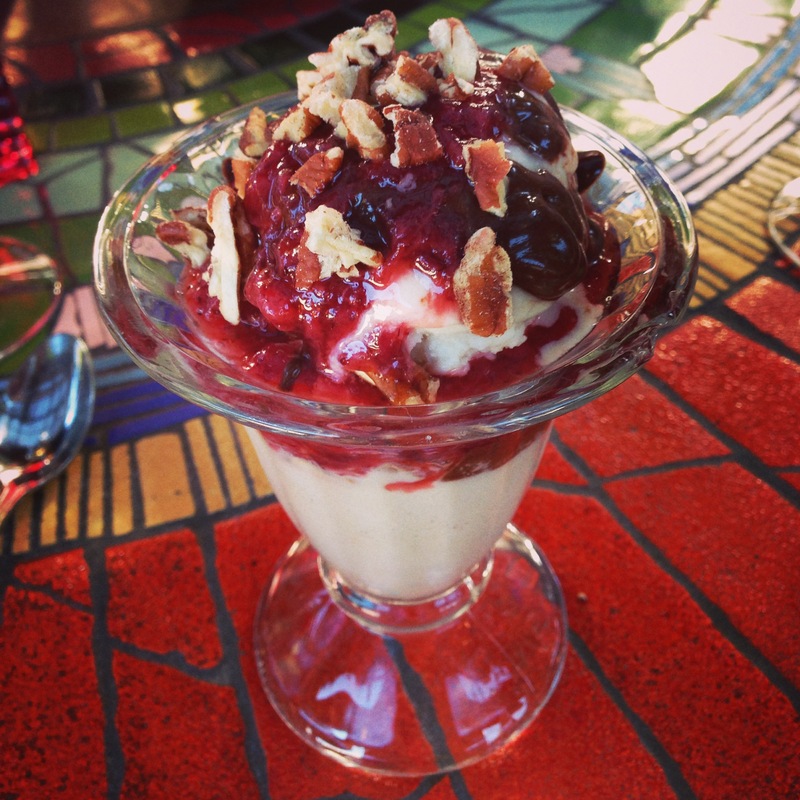 Oh yes, next time we’re in Cambria, we’re going to Robin’s Restaurant, and I may order the sundae as an appetizer. Robin’s gets an undisputed 5 Sprouts for vegan/vegetarian variety alone, but flavor, effort, and enjoyment definitely factor into this score! Thanks Robin & Shanny Covey for a memorable meal!